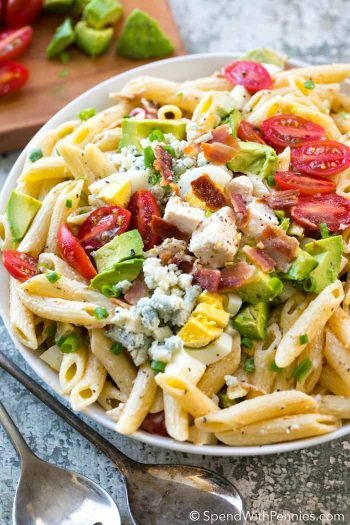 Summer pasta salad is always a fan favorite around here! There’s just something I love about a fresh cold pasta salad on a hot day. This easy recipe starts with garden fresh veggies and tender pasta, I create a very simple dressing to allow the summery flavors of the vegetables to shine through. We top it off with fresh herbs and a little bit of feta cheese for the perfect summer salad! 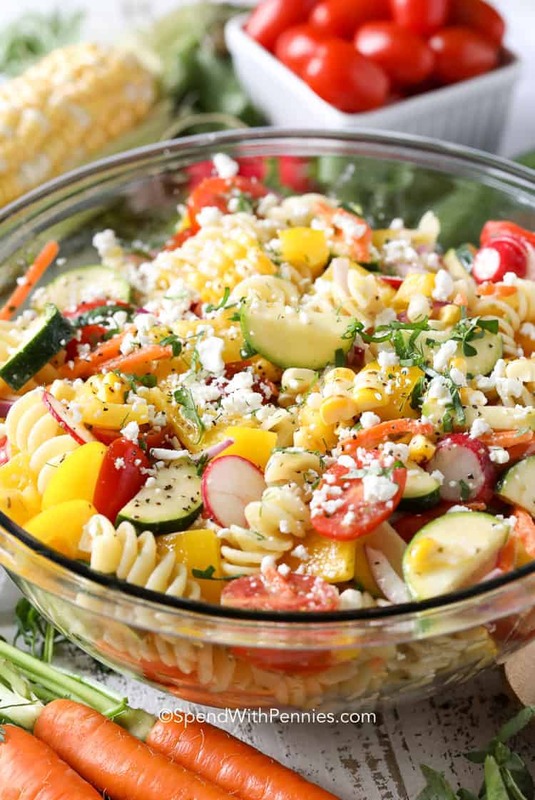 This delicious signature Summer Pasta Salad recipe is sponsored by Walmart and SheKnows Media. 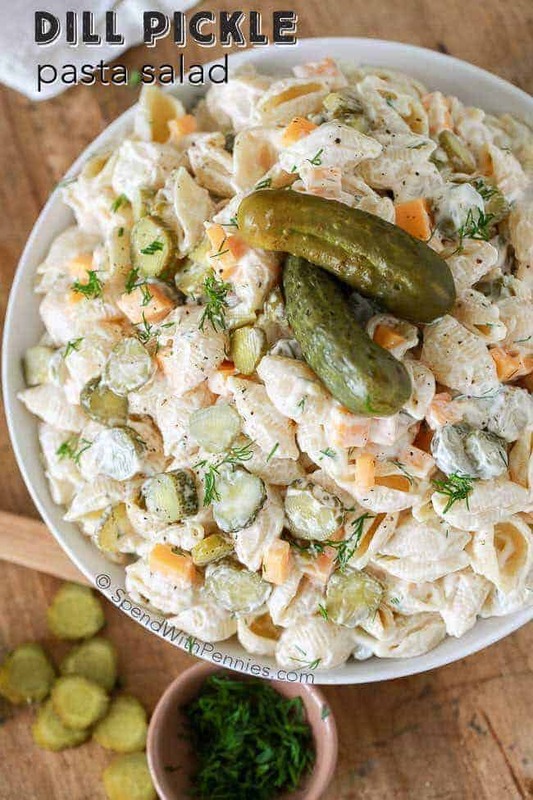 Pasta Salad is pretty much a summer staple around here whether it’s my famous Dill Pickle Pasta Salad or a more traditional Greek Pasta Salad. Fresh ingredients all tossed together in a dish that can be a lunch, a side or a complete meal on its own. In this easy Summer Pasta Salad, I really focus on the amazing fresh produce that is abundant in our garden (or I purchase fresh produce at Walmart). Adding in a simple dressing makes this pasta salad delicious and fresh! 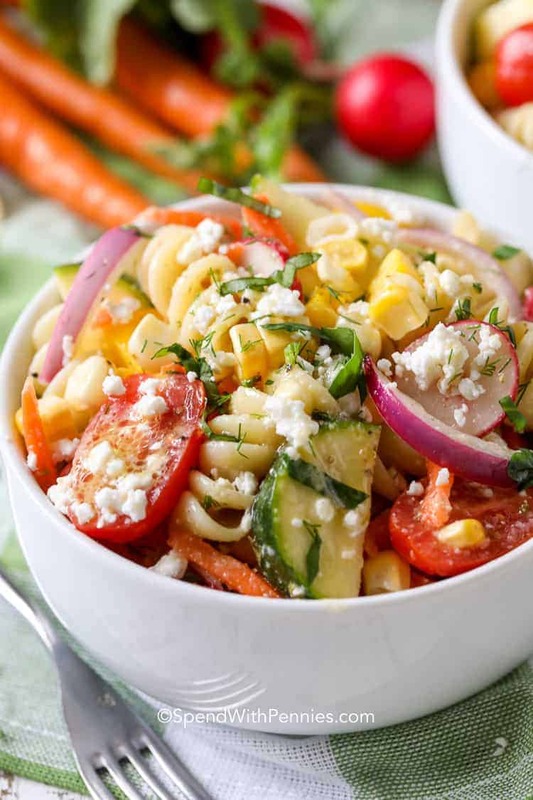 This Summer Pasta Salad captures everything wonderful about summer… crisp fresh vegetables with a fun crunch and bright beautiful colors. 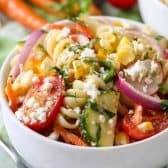 I love new ways to use my garden vegetables but if you don’t have a garden, Walmart has an amazing selection of organic vegetables perfect for this pasta salad recipe! 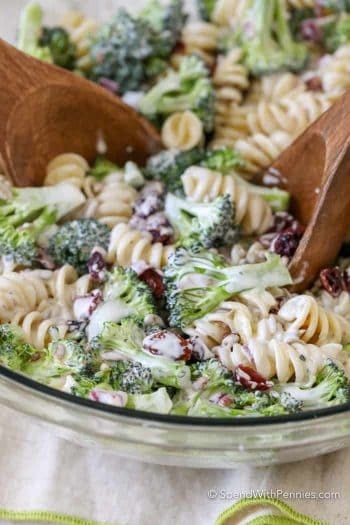 If you have veggies that you need to use up, this easy pasta salad is the perfect way to do it! I love adding fresh mushrooms, celery, or even diced jalapenos to this pasta salad recipe for an added kick! This recipe has a super simple homemade vinaigrette style dressing which is flavorful and light. Since I am using fresh veggies, I love to make sure that I am using the best quality ingredients for the dressing (without breaking the bank). 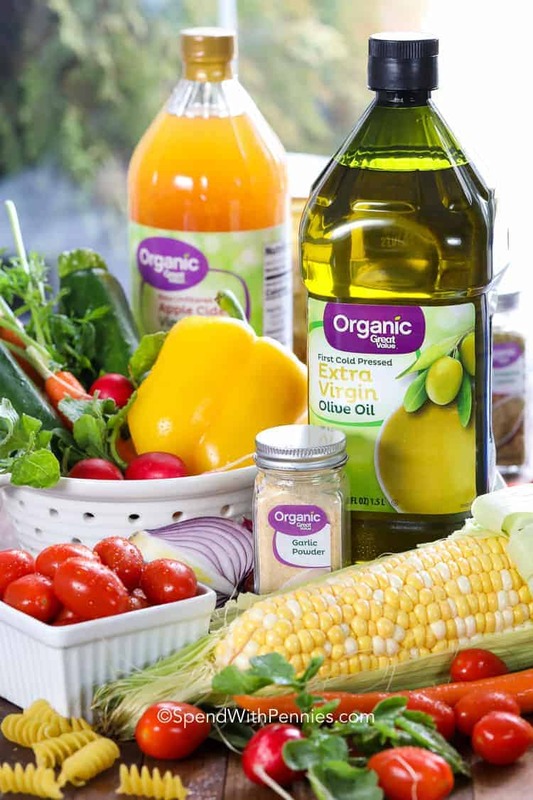 The base for this vinaigrette starts with Great Value Organic Olive Oil which is nice and light, I add in a bit of Great Value Organic Cider Vinegar, lemon juice, garlic powder and oregano for tons of great flavor. Great Value Organics products (found at Walmart) give the quality I am looking for while keeping prices in check! 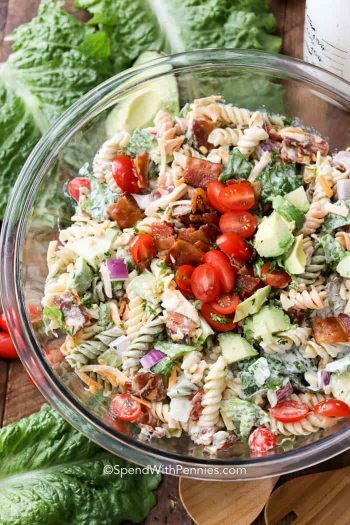 My favorite part about this pasta salad recipe has to be its versatility. If you want to serve it as a side, you are set! Want to create a complete meal? 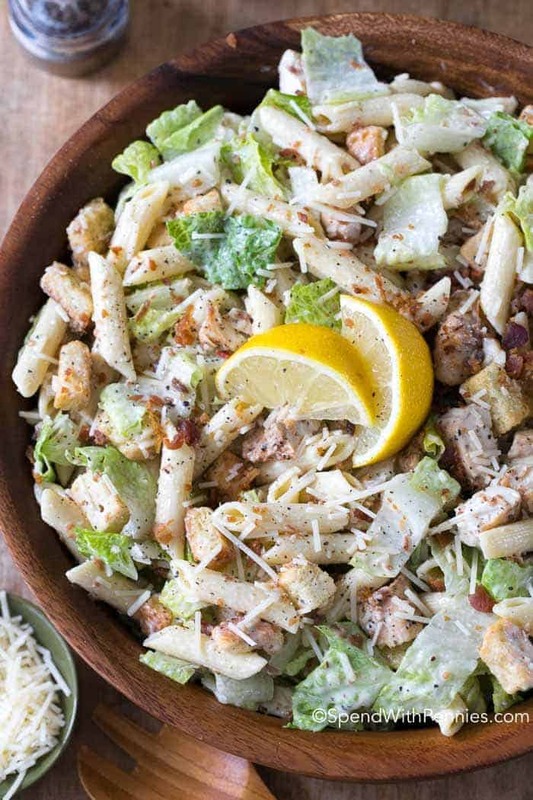 Add some grilled chicken or turn it into a tuna pasta salad with some canned tuna! The options are seriously endless here. I’ve added in my favorite veggies but any veggies you’re pulling from your garden (or grabbing when you get your groceries) are perfect in this recipe! 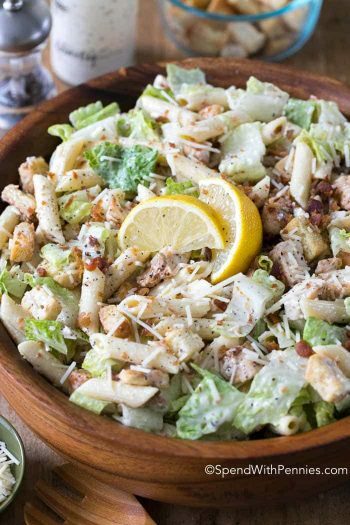 If you are hosting a cookout or barbecue, this summer pasta salad recipe pairs perfectly with some Grilled Honey Mustard Chicken! Time to fire up that grill! 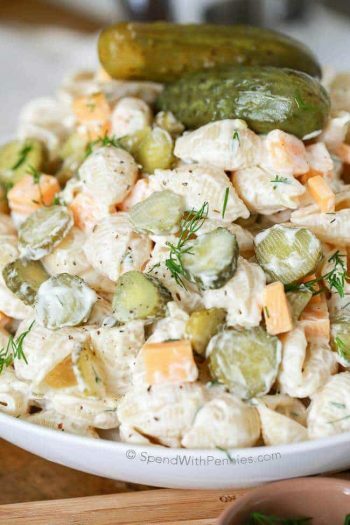 Pasta salad is the perfect side dish for anything outdoors. With pasta salad, you want to start off by cooking your pasta noodles al dente in salted water. I use rotini in this recipe, which I find really holds in the rest of the flavors from the dressing but any medium shape (such as penne or shells) will work. 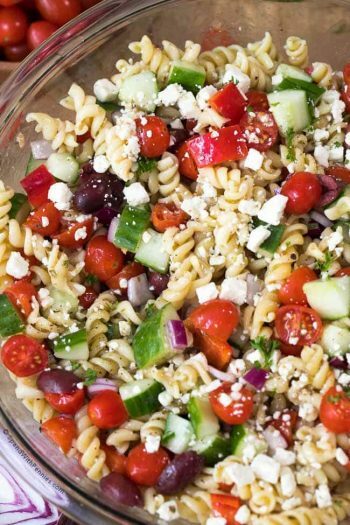 When you are making this Summer Pasta Salad, rinse your noodles under cold water once cooked so they don’t overcook and get mushy. While your noodles cook, it is time to get your vegetables ready (I always wish I had a sous chef for this part). Make sure your veggies are cut into small pieces before you add them to the pasta salad, so you can enjoy multiple flavors in each bite! You will want your pasta to be cool before you toss everything together so you don’t begin to cook the vegetables. Simply toss your pasta, veggies, and dressing together and store in the fridge until you are ready to serve it! The amazing thing about pasta salad is that it is even better made ahead of time. The dressing has a chance to soak into the pasta and veggies, so the flavors will intensify overnight. 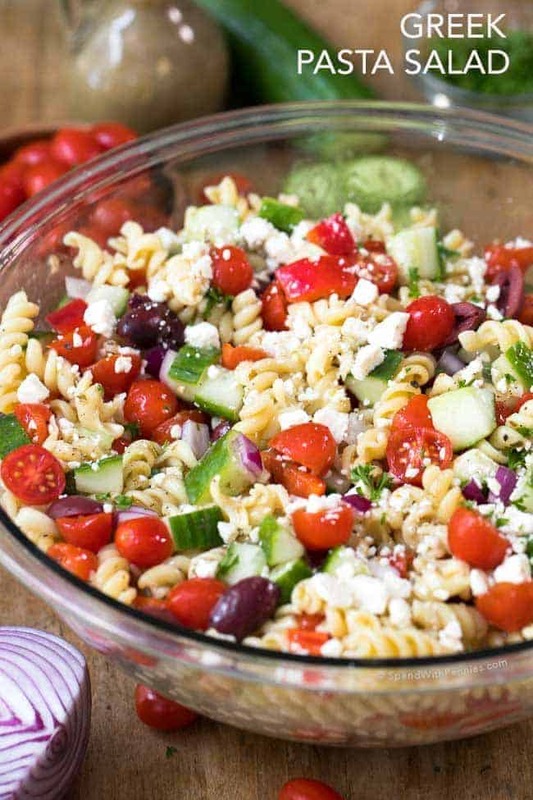 It makes this pasta salad recipe the perfect make ahead option! Garden fresh veggies and tender pasta tossed in a simple fresh dressing. Cook pasta al dente according to package directions. Drain and run under cold water to stop cooking. Combine all dressing ingredients In a mason jar and shake well to combine. Combine pasta and remaining ingredients in a large bowl. Toss top combine. Top with additional feta cheese and herbs if desired. We used fresh dill and parsley but any fresh herbs are great in this summer pasta salad. This looks like summer in a bowl! I love it! Seeing your feta reminds me that a recipe I made today was supposed to have crumbled feta on it to enhance it, but I forgot to add it, oh well lol. It is just like summer in a bowl… bummer about forgetting the feta!